Mack Brock “Covered” Cd is being released on March 22nd! **This post is sponsored. Post contains affiliate links. Are any Frugal Shopping and More readers Mack Brock fans? If so, here is some Good News! The Mack Brock “Covered” Cd is being released March 22nd! Plus, when you pre-order, you will also get the single “I Am Loved.” Pre-Order here. He has been a worship leader for over 15 years and co-wrote “O Come To The Altar”, “Resurrecting”, “Here As In Heaven”, and “Do It Again” - each has had a significant impact on the church worldwide. Three of Mack’s songs have landed in the Top 50 on CCLI and four in the Top 100 CCLI songs. Mack served as the music producer and a key worship leader with Elevation Worship for a decade and had led thousands in worship in arenas and auditoriums all across the United States. Mack is married with 2 children and lives in Charlotte, North Carolina. A 9-song studio project Greater Things is currently available. 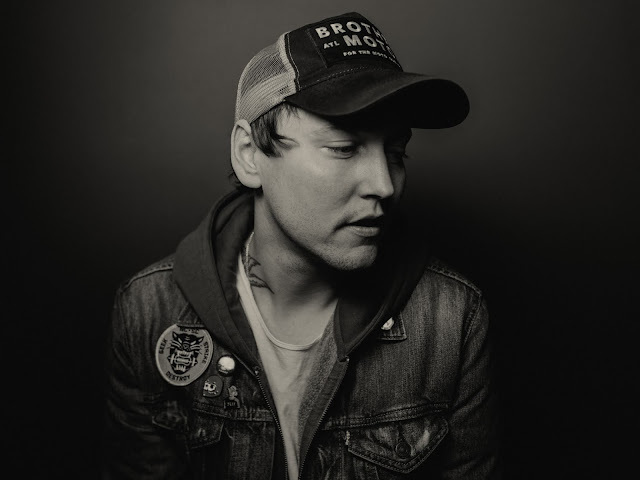 You can connect with Mack on his Facebook, Twitter, and Instagram accounts. Disclosure: The writer may have received a product for free as a condition of this publication. Regardless, all the opinions are those of the writer. Some of my favorite things I do to relax include reading, snuggling with my fur babies, and bird watching. I have multiple bird feeders in the front and back yards, that way I can view a wider variety of birds throughout the year. Last month I ordered some black sunflower seeds, from Chewy.com, for the Cardinals that seem to like the more secluded back yard. This month I ordered the 20 lb. 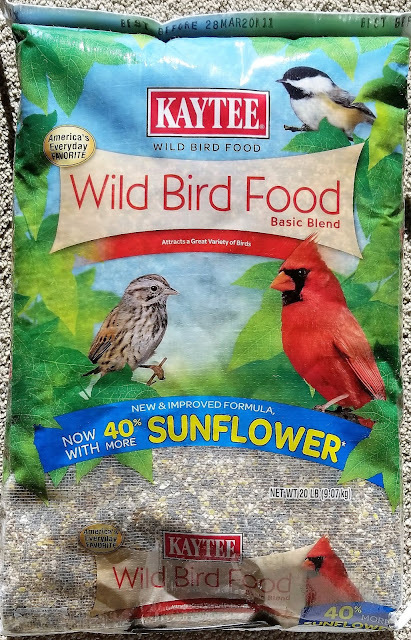 bag of Kaytee Basic Blend Wild Bird Food for the front yard feeders that seems to attract the bolder birds. Chewy lets me order pet products from my the house which really helps me save even more money because I don't have a chance to browse throughout the store as I head for the pet department. Another great thing about ordering from Chewy is their auto-ship program where I can add and remove items to my monthly delivery schedule. I appreciate the bag having a handle so I can carry it up from the vehicle to my office which is located upstairs. Once the bag is opened the handle comes off but that is okay since I pour rest of the bag of seed into a plastic bin with a lid. 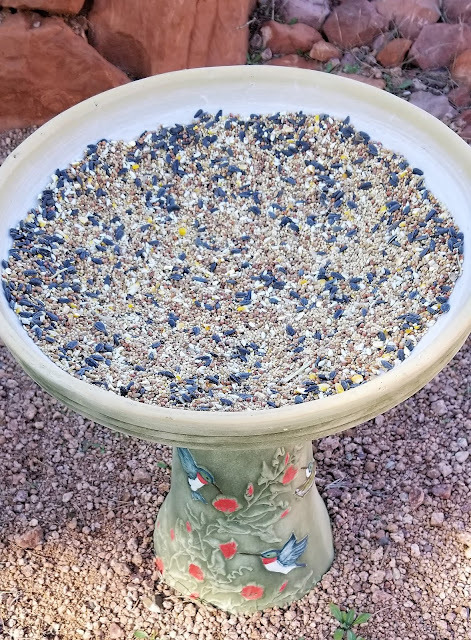 So far this basic bird food blend has attracted some year-round resident birds like Mourning Doves, Cardinals, Chickadees, Blue Jays, curved billed Thrashers, and Finches that feed here daily. There have been a couple of migrating birds such as Robins and Western Bluebirds that have stopped by recently. What is in Kaytee Basic Blend Wild Bird Food? The ingredients: Grain Products, Sunflower, Calcium Carbonate, Vitamin A Supplement, Vitamin D3 Supplement. These ingredients seem to make many birds happy considering the fact that I have to refill all the feeders every few days. 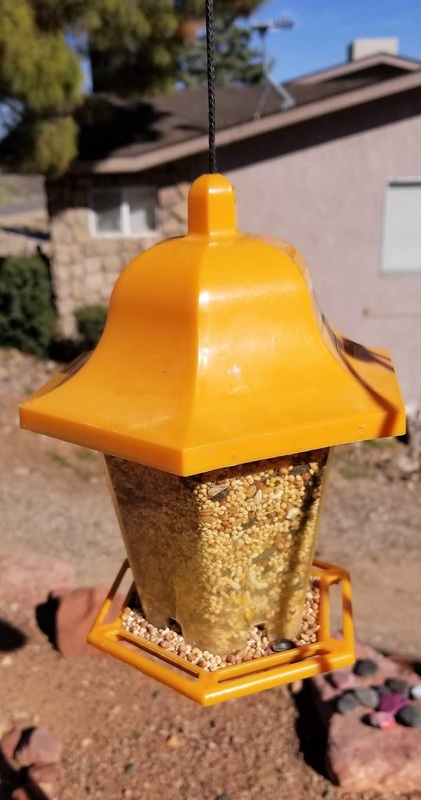 This food can be used in different types of bird feeders such as hoppers, tubes or in a bath that froze and cracked so it no longer holds water but it can hold bird seed. Will I continue to order this bird seed from Amazon, yes! The convenience and the price along with happy birds make it well worth it! Get 1-2 day free shipping on orders over $49. Save 20% off your first order if you set up a delivery schedule through the auto-ship program where you can add and remove items to your delivery schedule, skip a shipment, change the shipping dates and cancel your order at any time. Visit Chewy to learn more and connect with them on Facebook, Twitter, and Pinterest to keep up with current promotions and specials. Contact frugalshopping1@gmail.com for questions or to have your product featured on this blog.